Enkay Spiral Sewn Buffing Wheels are the most common wheels used for general polishing. Enkay's spiral design provides a tighter stitching than a single stitched or loose sewn buffing wheel. This allows for greater pressure to be applied to the work surface and therefore allows the user to get more scratches out of the work piece. Enkay Polishing has a variety of sizes and thicknesses available to accommodate almost every buffer and motor on the market. 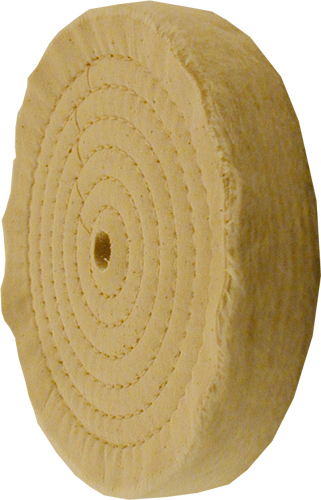 Unmounted Spiral Sewn Buffing Wheels should not exceed 3,600 RPM. All Enkay Buffing Wheels must be used with polishing compound.